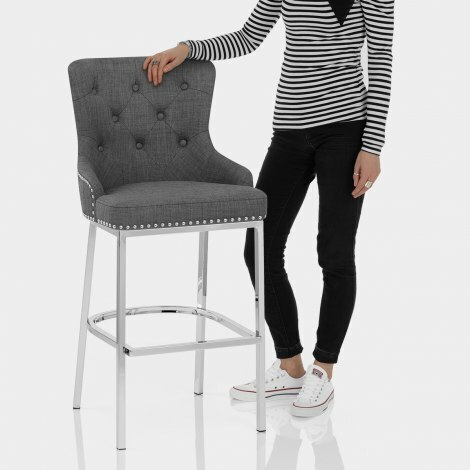 The Grange Bar Stool Charcoal Fabric has sublime style and is expertly crafted to create a luxurious statement in your interior. A truly sophisticated model with deluxe details, the Grange stands out from its contemporaries as something quite different. The seat exudes comfort with plush charcoal fabric and foam padding. Lending an ornate feel, the high backrest features button and stitch decoration together with metallic stud edging. A solid four-legged frame supports the seat and is plated in sleek polished chrome. Fixed at kitchen counter height, the frame includes strengthening bracing bars and these form a handy footrest. Protective floor plugs are a final practical addition to this wonderful design. Such a helpful company with fantastic products.